Puppy Preschool: Surviving the first few weeks. Introduction to socialization, items in house such as vacuums, etc. and review of topics regarding owning a dog such as licensing, housebreaking, feeding, and leash walking. The next training class starts on (date TBD) at Jefferson Veterinary Hospital. Once the date has been determined, please click here for more information. If interested, please complete and submit this Registration Form. To pay online, please click here. Basic Obedience: Can I teach my dog some manners? Teaching your dog the basics: Heel, Sit, Down, Stay, Watch me, & Come. The next training class starts on February 5th at Jefferson Veterinary Hospital. Please click here for more information. If interested, please complete and submit this Registration Form. To pay online, please click here. Intermediate Obedience (Obedience Class II): I didn't realize how smart my dog really is! This series of classes teaches the use or targeting and intermediate bridging to build on basic obedience training and off leash control. Basic Obedience classes are a prerequisite unless otherwise approved by Most Fine Canine Inc. The next training class starts on (date TBD) at Jefferson Veterinary Hospital. Once the date has been determined, please click here for more information. If interested, please complete and submit this Registration Form. To pay online, please click here. 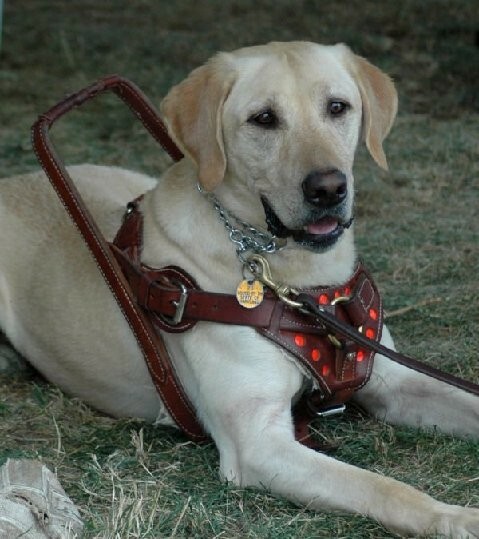 Most Fine Canine, Inc. has successfully trained and continues to train service dogs for children and adults with mobility and neurological disabilities. Leslie is the founder and a member of the International Association of Canine Professionals (IACP) Service Dog Committee. Social/Home Basic Obedience: Social/Home education involves housebreaking and setting basic ground rules such as what are the proper items to chew, expected behaviors when socializing with people in the home, guests, and to other animals. Most Fine Canine, Inc. recommends beginning this when the puppy is 8 to 16 weeks of age. Basic Obedience: Basic Obedience training involves attaining the general skills of having the dog focus on its handler and to sit, down and walk without pulling on a leash around distractions. Most Fine Canine, Inc. recommends beginning this when the puppy is 4- 6 months of age. Intermediate Obedience: Advanced Obedience training involves attaining the skills of having the dog focus on its handler and to sit, heel (walk beside you), down, come, stay, and leave it. Most Fine Canine, Inc. recommends beginning this level when the puppy is 6 months of age or older. Pet Partner ©Therapy Animal Team Instruction and Evaluation: Leslie is registered with Pet Partner© (formerly known as the Delta Society Pet Partner Program©) as a Therapy Team Handler, Instructor, and Evaluator. The next Pet Partner Team Training Class is scheduled for (date TBD) (by appointment only). Pet Partner Team Evaluations are scheduled for (date TBD) (by appointment only). Puppy Temperament Evaluation: Most Fine Canine, Inc. has extensive experience in assessing litters of puppies (recommended to be done at 7 weeks-of-age for the best accuracy) and aiding the breeder or purchaser in determination of the puppies’ inherent characteristics to best perform as a pet, sport, or working dog. Assistance in Canine Selection-Finding the Right Dog for You and Your Activities: Most Fine Canine, Inc. has extensive experience in assessing adult dogs for placement in pet, sport, or working dog environments. While the heart should be involved in picking a puppy, the brain must also be engaged. It is important to pick the dog that bests suits your and your family members’ lifestyle and level of activity. — Most Fine Canine, Inc.